For sale is a CGC 3.5 copy of Amazing Spider-Man #14. 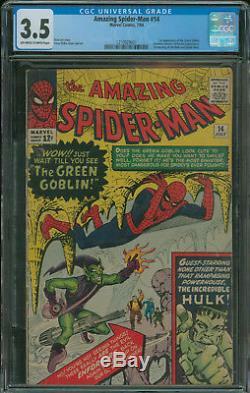 This issue is the first appearance of the Green Goblin. Please let me know if you have any questions. Be sure to check out my other items for many more key issues. The item "Amazing Spider-Man #14 CGC 3.5 1st appearance of the Green Goblin" is in sale since Friday, November 2, 2018. This item is in the category "Collectibles\Comics\Silver Age (1956-69)\Superhero\Spider-Man". The seller is "gsgcomics" and is located in San Antonio, Texas. This item can be shipped to United States, Canada, United Kingdom, Denmark, Romania, Slovakia, Bulgaria, Czech republic, Finland, Hungary, Latvia, Lithuania, Malta, Estonia, Greece, Portugal, Cyprus, Slovenia, Sweden, Belgium, France, Ireland, Netherlands, Poland, Spain, Italy, Germany, Austria, Mexico, Switzerland, Norway, Ukraine, Croatia.